What is the Dropbox promotion on Dell devices? If you’ve recently purchased a Dell consumer computer or Android tablet, you may be eligible for an additional 20 GB of included Dropbox space. Note: Some Dell promotions may only apply to new Dropbox users. No. Each Dropbox account can only redeem this promotion once. No. The promotional space is only available to the original buyer of the eligible device. Why am I not eligible to redeem the promotional space? The Dropbox app was not pre-loaded on your device. You bought your device pre-owned or refurbished, and the previous owner redeemed the promotion associated with the device. Each device can only earn promotional space once. 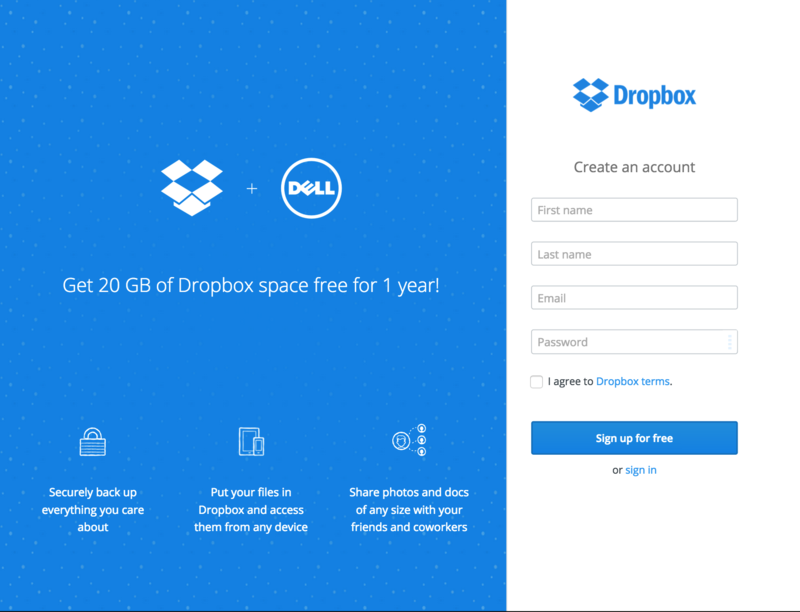 Some Dell promotions may only apply to new Dropbox users. How do I claim this promotion? Sign up or sign in through the Dropbox application on your eligible Dell device in order to link it to Dropbox. Complete at least 5 steps of our Get Started guide within 90 days of connecting your eligible Dell device to your Dropbox account. How do I complete the Dropbox Get Started steps to claim my promotional space? How do I link my Dell computer to Dropbox? You can sign up for a new Dropbox account by filling out the details on this page. If you already have a Dropbox account, click sign in. How do I link my Dell tablet to Dropbox? To link your Dell Android tablet, locate the Dropbox app from the app drawer and sign in to your Dropbox account. I’m unable to redeem the promotional space on an eligible device. Can you help? Did you complete at least 5 out of 7 steps from the Get Started guide? Please note that you have to complete these steps within 90 days of linking your Dropbox account to your Dell device. Did you sign in to the Dropbox app with another Dropbox account? You may only redeem the promotion with the first Dropbox account you used to sign in to Dropbox on the eligible device. The promotion may not be transferred between accounts. If you do not have access to the email address that was first used to log in to Dropbox on your device, you will not be able to redeem the promotion. You can verify when your bonus space expires by going to your account page and clicking View space earned. When your promotional deal expires, your Dropbox space limit will automatically return to what it was without the promotional space. For example, if you have a Basic account, your limit will return to 2 GB (and any space you've earned through referrals or other bonuses). If you're over your limit after expiration, you'll no longer be able to save new photos, videos, and docs to Dropbox. You'll be able to get more space by upgrading to Dropbox Plus. Looking for Dell-specific support? Please visit Dell’s Support Center.